Rest of system: Wilson Audio MAXX series 3 speakers , NeoDio NR Two transport and NR22T transport & NR22D DAC, Tonearms: Ikeda 9″ IT 345 and 12″ IT 407, Cartridges: Dynavector DRT XV-1s Mono and DRT XV-1t Stereo, Critical Mass Systems Black Diamond QXK racks and PXK stands (World Premier), Kubala-Sosna Emotion interconnects, speaker cables, power cords, tonearm cable, Redpoint Solo Voce turntable and rack (World Premier). Rest of system: Wilson Audio Sasha speakers , NeoDio NR22 CD transport/DAC, Hanss T-90 turntable (World Premier), Graham Phantom II tonearm , Harmonic Resolution SXR-1921-3T3 frame system, Hamonic Resolution M3X-1923 custom isolation bases, Kubala-Sosna Emotion interconnects, speaker cables, power cords, tonearm cable. Truly great sound is a constant. It doesn’t go out of style or favor, and it doesn’t require creative reasoning or longwinded justifications to explain. For two years now, Lamm Industries ML3 Signature mono amplifiers ($139,290/pair) and Wilson Audio MAXX 3 speakers ($68,000/pair) have been the foundation of truly great sound. Actually, we can go one step further: This Lamm/Wilson combination has been responsible for the best sound we’ve heard at the past two CESes, and by no insignificant margin. What has defined this great sound has been rather simple: a colorful tonal palette, spacious soundstaging, and exceedingly wide bandwidth. Any type of music worked on this system — from classical, which we heard quite a bit of this year, to horn-driven jazz and even fast-paced rock. Lamm used CES to demonstrate its LL1 Signature four-chassis preamp ($42,690) for the first time, and rounded out the electronics with an LP2 Deluxe phono stage ($7290). The new Redpoint Solo Voce turntable with its matching rack ($96,000) supported two tonearms — a 9″ Ikeda IT 345 ($6200) and a 12″ IT 407 ($6800) — and two cartridges — Dynavector XV-1t ($9000) and XV-1s Mono ($5500). A NeoDio NR22T CD transport ($13,000) and NR22D digital-to-analog converter ($12,000) provided digital playback. All cables were from Kubala-Sosna’s Elation series, with racks and amp stands from Critical Mass Systems. Will Lamm and Wilson attempt to hit the jackpot in Las Vegas next year? We’re betting on it. There were many rooms that could fairly be considered to be contenders (Karan Acoustics/Avalon, Electrocompaniet, Zanden/Grand Prix Audio/Wilson Audio, and the stunning Scaena to name only a few) but for me the best of the best came down to the two Lamm Industries rooms. Both were truly spectacular and featured Wilson Audio loudspeakers. In the larger room, MAXX Series 3s ($68,000/pair) were driven by Lamm’s four-chassis ML3 Signature monoblock amplifiers ($139,290/pair) and the new LL1 Signature four-box dual-mono preamplifier ($42,690). Also on duty was Lamm’s LP2 Deluxe phono preamplifier ($7290). Everything was tied together with Kubala-Sosna’s recently introduced Elation-series cabling (interconnects and speaker cables both $6000 for the first meter, $1200 for each additional meter). Music was provided by NeoDio’s NR22T transport and NR22D DAC ($13,300 and $12,000, respectively) and Redpoint’s immense Solo Voce turntable ($96,000), which was fitted with two Ikeda tonearms and Dynavector XV-1s mono and stereo cartridges. Critical Mass Systems Black Diamond racking held this amazing assemblage of components. The other Lamm room featured M1.2 Reference ($22,290/pair) or ML2.1 ($29,990/pair) mono amplifiers on Wilson Sasha W/P speakers ($26,900/pair). Up front were Lamm’s updated LL2.1 preamp ($5990), LP2 Deluxe phono stage and NeoDio’s NR22 one-box CD player ($15,000). The turntable was a Hanss Acoustics T-90 ($45,000) carrying a Graham Phantom II ‘arm ($4900) and Ortofon MC A90 cartridge ($4200). Kubala-Sosna Emotion-series cabling (interconnects and speaker cables both $3000 for the first meter, $900 for each additional meter) connected it all. Here, Harmonic Resolution Systems stands and isolation bases were installed. Both rooms provided sound that would have to be considered stellar under any circumstances, much less within the context of an audio show, but the ML3/MAXX 3 room was beyond every audio system I have heard save for David and Sheryl Lee Wilson’s breathtaking home system. Playing my own LPs in that room, I was awestruck by the sense of scale, timbral completeness and lifelike verisimilitude of the music. Truly, this had to be heard to be believed. Do you have extra shelf space and $42,690 to spend on a new statement-level preamplifier? If so, Lamm Industries of New York City has a solution for you. Lamm used CES 2010 to debut the four-piece LL1 Signature preamplifier, which is intended to complement their ML3 Signature mono amplifier that retails for $139,290 per pair. Like all Lamm gear, the LL1 Signature has been designed by Vladimir Lamm, whom the company’s obviously named after. Vladimir is a well-respected designer who has strong opinions about how audio equipment should be designed. His designs are expensive and unique. The LL1 Signature is a monaural, two-chassis design, meaning each channel requires a control unit (upper shelf) and a power supply (lower shelf). As with all of Lamm’s top-of-the-line designs, the LL1 Signature is an all-tube, pure-class-A design with no overall feedback. According to Lamm, the LL1 uses four low-impedance triodes paralleled into a single inverting gain stage. Volume is controlled through a TKD stepped potentiometer, which the company feels is the best available today. We looked around back to see the various inputs and outputs and noticed the words “pseudo balanced,” which we questioned Vladimir Lamm about, since the trend in high-end preamplification today is for fully balanced designs. However, Vladimir doesn’t feel it to be the best way to go. When pressed for an explanation, he told us point blank that it would take too long to explain, but that the “pseudo balanced” outputs included here are for compatibility, so customers can use their existing balanced cables, and those who use single-ended cables will derive all the benefits that the LL1 Signature provides. According to Lamm’s literature, the LL1 Signature is the “ultimate statement of perfection” and a “match made in heaven” when used with the ML3 Signature. I guess only those people with nearly $200,000 to spend on a preamp-amp combination will ever know. The rest of us are simply left to wonder just how impressive a product like this might be. One of the great things about coming to CES is getting the opportunity to hear gear that’s rarely near. I was really happy as I strolled down the 35th floor to walk into the Lamm room. I don’t have a Lamm dealer in Minneapolis so I haven’t ever had the chance to hear this lauded and expensive tube gear. The Lamm room featured a cost-no-object system that included the world premiere of the Lamm LL1 Signature Preamplifier. This $42,690 statement is a four-chassis dual-monophonic preamplification system featuring separate power supplies for each channel as well as separate control modules for each channel. It’s a whole lotta preamp. The LL1 works in single-ended class-A operation with no overall feedback and uses specially selected, high-transconductance, dual-triode 6N30P-DR tubes in its signal path, along with TKD stepped potentiometers for volume control. It has three single-ended inputs and will output via XLR or RCA jacks. Amplification in the Signature system in the Lamm room featured the ML3 Signature power amplifiers ($139,290/pair). Like the LL1 preamplifier, the ML3 isalso a four-chassis system. These 32W, single-ended, pure class-A amp is based on a direct-heated GM-70 triode. The sound in the Lamm Industries system started with a digital front end from NeoDio, a full complement of Kubala-Sosna cables, and the Wilson MAXX 3. I totally blissed out listening to Arleen Auger singing works by Aaron Copland. The total cost of this system as I heard it was more than $335,000. This doesn’t include the analog front end that wasn’t hooked up yet. I’m still wondering why this system wasn’t under my tree this Christmas. Jason Victor Serinus comments: In their large suite on the top floor of the Venetian, I think I got closer to the Lamm/Wilson experience than ever before. But what I heard puzzled me. On the one hand, listening to a voice I know very well, that of operatic tenor Fritz Wunderlich, I experienced a realistically scaled operatic voice and an equally credible, large soundstage. That’s what big speakers on the order of the Wilson MAXX3s can do. The air around the voice was marvelous, as was the magical beauty of the midrange. But on both the Wunderlich recording and another of a female jazz singer that was playing when I entered the room, I heard a metallic electronic edge around the voice that to these ears sounded artificially etched. I’m pretty familiar with the ringing sound of a large operatic voice, and how it interacts with acoustic space, but this was something different. Erich Lichte, who had visited this room when the turntable was not yet in operation, told me that he heard nothing of the sort on his CD of soprano Arleen Auger singing Love Songs. Who knows what was going on? The Wilson MAXX 3 driven by Lamm’s new LL1 Signature preamplifier and ML3 power amplifiers electronics was gorgeous—the best I’ve heard this speaker sound. LAMM introduced an ambitious new preamplifier that complements the company’s $139k-per-pair ML3 power amplifiers. The new LLA Signature is a four-chassis unit that is Vladimir Lamm’s ultimate statement in preamplifiers. The all-tubed LL1 sells for $42,690. I don’t know if it was the new preamp, the ML3 power amplifiers, the Wilson MAXX 3, or a synergy of these components, but the system sounded absolutely wonderful — spacious, delicious in tone color, and wonderfully dynamic. Best Sound: The Wilson MAXX 3 driven by Lamm electronics was gorgeous — the best I’ve heard this speaker. The big Lamm room, anchored by Wilson MAXX 3s. Breathtaking, ravishing, and — other than occasional loose bass — sonically invisible. I know live music, and this is what it sounds like. Lamm Industries’ premier room packed a punch with the ML3 Signature amplifiers ($139,290/pr.) driving the Wilson Audio MAXX 3 speakers, partnered by the Lamm LP2 phono preamp deluxe ($7290) and Kubala-Sosna Elation Series cable and interconnects. Yet another synergistic combination. Lamm Industries LL1 Signature preamplifier, $42,690/pr. This was the World Premier. Vladimir Lamm was most hospitable in giving us a complete ‘tour’ of his products. Wonderful electronics indeed. NeoDio NR22 CD transport/DAC $15,000 new to the US… from France and a very well built piece of kit. The Lamm Industries LL2.1 line level preamplifier, $5990. Another World Premier. The inside of the Lamm LL2.1 preamplifier. Lamm M1.2 reference amplifiers, $22,290/pr and also the ML2.1 amplifiers, $29,990/pr. Cabling is Kubala-Sosna Emotion, and Wilson Sasha loudspeakers, $26,900/pr. The Lamm system with Kubala-Sosna and Wilson sounded very nice indeed. Lamm ML3 Signature amplifiers, $139,290/pr with Wilson Maxx3 loudspeakers, $68,000/pr. Kubala-Sosna Elation cables throughout. World premier of the Redpoint Solo Voce turntable with rack by Critical Mass Systems. All together this will set you back $96,000 for the table and the stand. The new collaboration between Redpoint and Critical Mass is beautiful, and sounds great too. In the background is the NeoDio CD player. Lamm ML3 amplifiers, Wilson Maxx3, and Critical Mass Systems stands wired with Kubala-Sosna Elation series cables. Lamm Audio/Wilson Audio – CES served as the coming out party for several Lamm products including Vladamir’s statement preamplifier, the $42,690 four box LL1 Signature line level preamplifier. The LL1 Signature features a single inverting gain stage pure class-A built around paralleled low impedance triodes. The unit, also, for those impressed by measurements, sports some very impressive specs (see the Lamm website, www.lammindustries.com). The analog source was the stunning $96,000 Redpoint Solo Voce turntable outfitted with the 12-inch Ikeda ($6800) arm and Dynavector DRT XV-1t cartridge ($9000). Tipping the scales as we Olympic weightlifters like to say 300 kilos (660 lbs)—and more than the world record for the clean and jerk world—the Solo Voce takes analog playback to the edge-of-the-art. I suspect the dramatic improvement in the room’s sound from days 2 to 3 may lead to some disagreement among show attendees regarding the sound of the Lamm/Wilson demonstration. For the first two days of CES (and of course one should discount what is heard for the first day or two of the show), the sound in the room proved disappointing. In fact, the “smaller” system in the second Lamm room featuring the Wilson Sashas sounded far better. Then Vlad, Peter and company got it together (part of the problem may have been the turntable as the Solo Voce was having trouble maintaining proper speed on day 2). On Saturday, the system really began to bloom and come to life. Spread out far apart and severely toed in as per the configuration that Wilson favors, the MAXX3 speakers threw a huge soundstage without any hole in the middle. Percussion on Saul Goodman’s Mallets, Melody and Mayhem on Capitol and voices on Bach’s Quodlibet on Telefunken were rendered with precision, delicacy and harmonic accuracy! What really impressed me the most about the sound in the room (and specifically the performance of the Redpoint table) was that this was one of the very few systems capable of tracking the bells and other percussion instruments on Saul Goodman’s Mallets, Melody and Mayhem on Capitol without breaking up. Oh yes, this was another room using Kubala-Sosna Elation cables and possessed that trademark KS midrange presence, delicacy, harmonic accuracy and low distortion! This show saw the world premiere of Vladimir Lamm’s new Lamm Industries LL1 Signature line stage, a four-chassis dual-monophonic pre-amplification system ($42,600), as well as Peter Clark’s redpoint audio designs Solo Voce turntable with its custom-engineered stand ($96,000). Further, this room featured the premiere of the new Critical Mass Systems Black Diamond QXK racks ($3300 per level) and PXK stands ($5400 each). The unassailable looking Solo Voce is a joint project. It combines Peter Clark’s remarkable flagship redpoint audio designs turntable with a custom matching to-the-floor stand from Critical Mass’ Joe Lavrencik. For this event, it was fitted with two different arms; the Ikeda 9″ ($9200) with a Dynavector DRT-XV-1s mono ($5500), and the Ikeda 12″ IT 407 ($6800) fitted with a Dynavector DRT-XV-1s stereo ($9000). I have been kept in the rapt bliss that my redpoint Model D has been consistently serving up since its arrival, and the Solo Voce should be even more of a very good thing. At just over 650 pounds, this is one serious transcription system, one that is as eye-catching as any such system I’ve ever encountered. 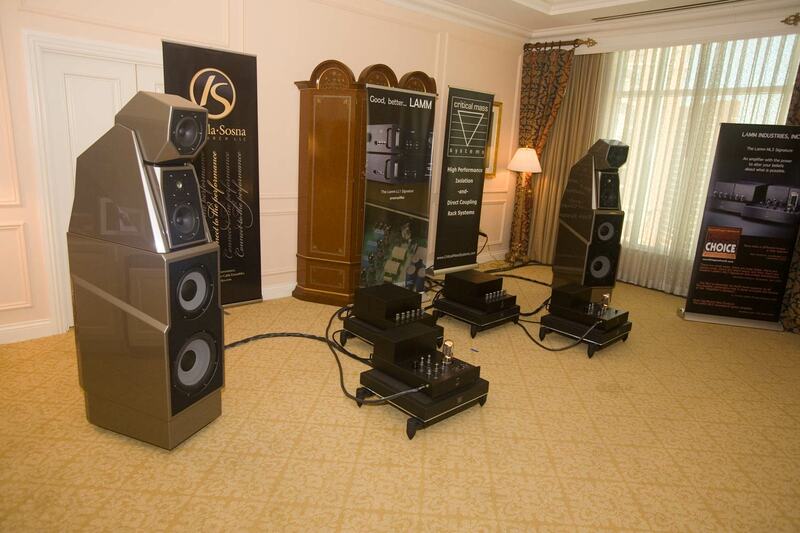 The rest of the system included the Lamm ML3 Signature amps ($139,290/pr), and the Lamm LP2 phono stage ($7200). The digital front end was the NeoDio NR22T transport ($13,300) and the NeoDio NR22D DAC ($12,000). Speakers were the Wilson Audio Maxx3 loudspeakers ($68,000/pr) and all cabling was, again, the new Kubala-Sosna Elation series. Having been able hear only an unknown recording of some full scale Orchestral music on the Solo Voce, all I could really tell was that it didn’t have the impact that my Model D has in my home system. Overall, not having any first-hand sonic knowledge of any of the rest of the assembled components, it was very difficult for me to speculate as to what might be holding this system back in the lowest registers. Regardless, I was sure that I wasn’t hearing the Solo Voce at its best, given the results I get in my own music room. In general, the sound here was very hard to describe, as it truly seemed to have very little character of its own. While the price of this system was approaching half a million bucks, to say that the room had no sound of its own just doesn’t cut it. While it was a truly remarkable assemblage of equipment, given the results I’ve heard in this (equivalent) room over the past several years, I was just a bit disappointed with the results this year. This event would also see the world premiere of the Lamm LL2.1 Deluxe line stage ($5990), and the Hanss T-90 turntable ($45,000). The Hanss T-90 was fitted with the new Graham Engineering Phantom II tonearm ($4900), sporting an Ortofon A90 ($4200) moving coil cart, and engineer Bob Graham just happened to be on hand to show it off. It was good to see Bob out at shows again as I haven’t run into him in a number of years now. The rest of the system included the Lamm M1.2 Reference amps ($22,290/pr), the Lamm ML2.1 Reference amps ($29,990/pr), the Lamm L2 Deluxe Reference preamp ($7290), and the Lamm LP2 phono stage ($7200). The digital front end was the NeoDio NR22 CD transport/DAC ($15,000), and everything rested on the Harmonic Resolution SXR-1921-3T3 frame system ($14,560), with Harmonic Resolution M3X-1923 custom resolution bases ($2795/ea). The speakers were the new Wilson Audio Sasha loudspeakers ($26,900/pr), and all cabling was from the Kubala-Sosna Emotion series. Honestly, while Lamm room One left me floundering for adjectives and modifiers to describe what I was hearing, or—more aptly—what I wasn’t, this rooms presentation seemed a bit more lifelike; more reminiscent of the live musical event. Though hardly what you could call affordable, with a price tag approaching a quarter of a million bucks, if I was offered either of these two Lamm hosted systems, given my own personal tastes, I would not hesitate to select this one. Since this is really early in the show, got to the Lamm room and somehow missed Elina, who is always a joy to see and chat with. Well, what’s a journalist to do… so here is a photo of Lamm Industries award-winning ML3 Signature. Well, well, spoke too soon and here is Elina! Here she is next to their new LL2.1 that was covered in the CES 2010 show preview. Business is picking up and they are looking forward to having us review more of their goodies. Check out our search ending for the many Lamm Industries reviews we already have online. This company is another husband and wife team, with Vladimir doing all the designing and likes to call himself “a theater of one actor”. He basically works on the details and oversees the implementation. Their gear is made in the USA by hand. 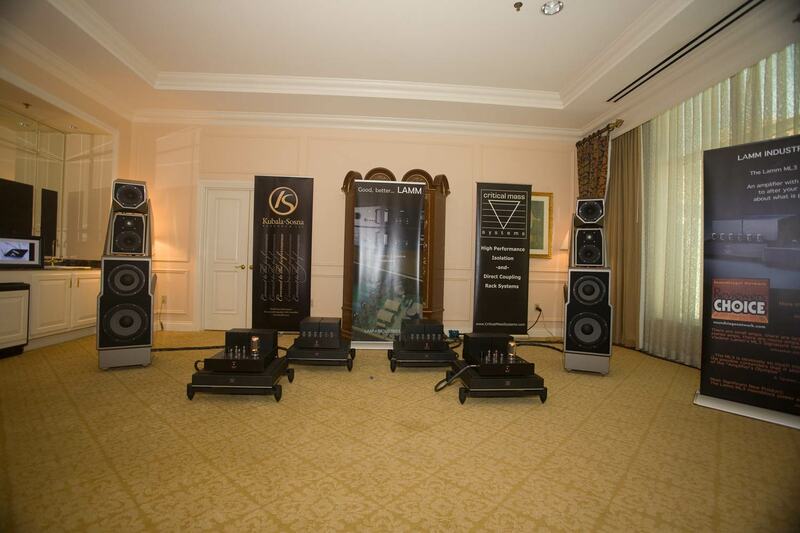 The Lamm room featured the Lamm ML3 Signature amps and new LL1 Signature linestage on the Wilson MAXX 3 speakers. Alsofeatured was the new Redpoint ‘Solo Voce’ turntable. The turntable experienced some issues during shipping but between it andthe CD player, both of which were played quite a bit, I came to understand some things about the new linestage and the systemitself. The LL1 Signature is much cleaner than the less expensive Lamm L2 Reference, and more detailed, revealing more of the delicacies of the music. scroll from the original link through images 532-552 for a full coverage of two Lamm systems. The presentation had excellent dynamic and spacial separation, decay, and resolution. Not quite the macro dynamics and linearity of which the electronics and speakers are capable of. Also some integration issues regarding the speakers (more about this later). I liked it, especially the separation. So rare at shows, and I think the manufacturers of the few components that can do this do not appreciate how much more like music this is.